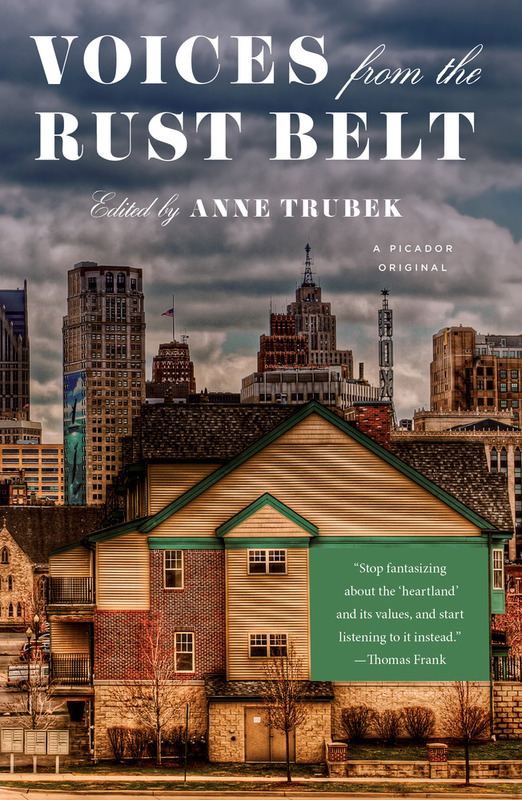 Voices from the Rust Belt is a collection of essays that are often poignant, equal parts depressing and uplifting. The voices are too often from rather than in the rust belt; that is, we do not hear the voices of people who still live there and struggle to survive and succeed. The essayists collected here include a writer and teacher, a novelist, a plant ecologist and professor, a lawyer turned writer, a professor of journalism, a poet, a professional coach, and a sports journalist. Each has a connection to the area through family, their birth, or even living in Cleveland or Flint, for example. These are successful people who have “made” it. Where are the people who are still struggling, still mired in poverty? A better balance would have been nice. What would Harry Golden or Studs Terkel have done? Still, the voices we hear are excellent and compelling, their prose uniformly strong and lucid. The essays fit into four sections: Growing Up; Day to Day in the Rust Belt; Geography of the Heartland; and Leaving and Staying. 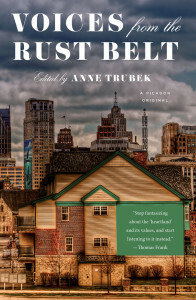 In a brief introduction, editor Anne Trubek attempts to explain why the rust belt still matters and why it is not just an American phenomenon. She notes that “just about any country with a history of manufacturing have rust belts where economies once based on industry” no longer exist. That last sentence gives rise to another weakness of the book and may explain the success Donald Trump enjoyed in the last election. The loss of jobs affected the “white working class…for over forty years…” seems to reflect the composition of the majority of contributors to Voices from the Rust Belt. Of the collection’s two dozen writers, one is clearly Iraqi while a few appear to be African American based on internal clues in their essays. One of the most prescient essays is by Henry L. Taylor, Jr, a self-described “black historian and urban planner.” He asks “Will Blacks Rise or Be Forgotten in the New Buffalo?” His account of the attempt to create a new Buffalo built on equity, inclusiveness, and diversity is an excellent historical recitation of what happens to minority communities when urban revitalization takes place. Since their land is less valuable (that is, produces less tax income), homes and business can be swept away to create infrastructure that serves those who already have much, a group Taylor calls “the latte group,” a white creative class. His is a particularly provocative and thoughtful article. Anne Trubek is the author of The History and Uncertain Future of Handwriting and co-editor of Rust Belt Chic: The Cleveland Anthology.